Fifteen Minutes is a collection of short stories about fame. Out now at Waterstones, City Books, The Kemptown Bookshop and available as an e-book and paperback on Amazon and via Unbound. The collection came about when a member of the audience at a Rattle Tales event asked me why I always wrote stories with famous people in them. I didn’t even know I was doing it. I suppose celebrity culture is so rife that it had worked it’s way into my creative thinking. The stories in this collection are about fame but not necessarily the famous. In fact the famous are relegated to bit parts in these stories, the people that matter here are ordinary people, so you get the story of a miner on the day of Margaret Thatcher’s death, a teenager obsessed with David Bowie, a failed Big Brother contestant and a chance meeting with Andy Warhol. I didn’t really try to get a traditional publisher for this collection. In the UK short stories aren’t considered to be something that sells and it is very hard to get a publisher interested in them. It can be frustrating to hear this on repeat as an answer to agent and publisher submissions. Instead I decided to crowdfund the collection through Unbound Publishing. I have blogged extensively about this experience on these pages. Suffice to say I like Unbound’s style. Mettler draws upon an extensive personal ‘hinterland’ to create the contexts for her stories, which is not something you can say about a lot of short story writers. 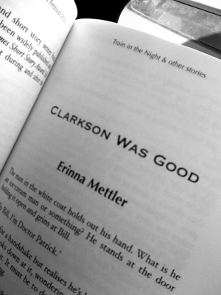 She’s as comfortable writing about a northern mill town, as she is about a faded American diner or the London art world. One of her stories, ‘What Me and Pa Saw in the Meadow,’ is set in a Mexico-based dystopia which is described so vividly that I could probably paint the lurid landcape from memory. All of the stories end with one line that just gives you chills and leaves you thinking “wow, now that is a statement”. I loved this collection of stories. They were refreshing and fun to read. These stories detail the almost imperceptible losses and victories that link together to form our everyday lives. Mettler forces us to see our own ordinariness in her words. In these tales she presents the paradox that our insignificance is also the means to our uniqueness in this world. Often, when there is something to be reported, ordinary people are used as witnesses by the broadcasting media, be it a shooting, a natural disaster, civil unrest. Erinna Mettler has given her characters enviable powers of observation, witty, graphic, and laced with unusual, unexpected metaphors. Such descriptive abilities are typically locked away in people’s thinking and are rarely articulated. In these stories, they are, so we engage in their narratives. The celebrities’ intrusions illuminate the characters’ relationships, which are superbly evoked, and often catalysts to catastrophe. Fifteen Minutes features twenty two short stories, all of which either contain a celebrity encounter, or an obsession with a particular celebrity or franchise. These aspects aren’t the focus of the stories though – instead Mettler uses them as a lens through which she focuses in on the workings of her other, non-famous characters. As a whole, it works well, and the author is able to experiment with a range of voices and styles over the course of the stories, injecting a large amount of interest and variety into a relatively short volume. She isn’t afraid to take risks either – with the stream of conciousness style story Miley Cyrus Fault a particular stand out for me in its originality. Each story explores humanity in a subtly different way – and combined these reads are moving, funny, and an intelligent meditation on how celebrity and fame impact all of us, whether we want them too or not. 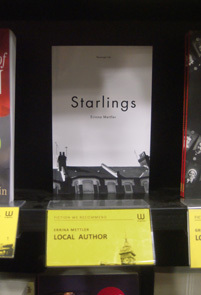 STARLINGS was published in 2011 by REVENGE INK. People are still discovering it. I’ll often get an email from a book group who are reading it or someone will share it on social media. I love that even after all this time it’s still reaching new readers. It’s available in paperback from City Books, The Kemptown Bookshop and Watersone’s Brighton and on order from Amazon in paperback and kindle format. STARLINGS is a daisy-chain novel set in the city of Brighton. Each chapter tells the tale of one of its varied inhabitants. Disparate lives collide in surprising ways, showing that often people are not in control of their own destinies, but are shaped by those they live next to. The episodes are not arranged chronologically, and though most are contemporary, others are set in the 1940s, 50s and 60s 70s and 90s. These tales are told cinematically but not in any uniform style. Characters crop up in narratives that are not their own: in the thoughts of others, in photographs, at parties, or simply walking by. The city itself is the one constant of the stories; its landmarks appear with varying significance. The Piers and the sea in particular are used to drive narratives, and provide reference points for the interior lives of the characters. The first review I read was absolutely terrible. I haven’t included it here, but I do get it out and read it occasionally because it makes me laugh now. Back then I thought it was all over, that the time and effort I’d put into writing the novel had been wasted and I should never pick up a pen and paper again. The second review I got was the first one posted below and made me think that maybe I wasn’t so bad a writer after all. The next review was in The Short Review and if I have a career as a writer until I’m in my nineties I don’t think I will get a better one! I don’t take any notice of them any-more, but I am amazed at how difficult it is to get a review in the national Press. If you don’t have an agent and are published by a small publisher you might as well forget it. Starlings has just sold out its first print run and is doing well on kindle but I still can’t get it reviewed nationally. If you would like to review it please get in touch. Epic, unchanging, the human condition is laid bare throughout these stories. Artfully, Mettler picks it apart, examines it, and then builds it back together again from a ruin, into something stronger, more coherent. 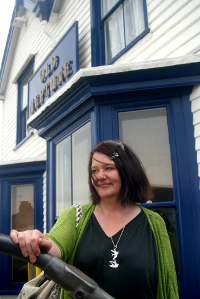 My good friend LONNY POP wrote this wonderful poem for my book launch – thanks Lonny!